Ticketmaster UK offers a wide range of tickets for events and gigs in London, from music to sports and everything in between. With events available for all ages, ticketmaster UK is one of the most popular and trusted ticket sales companies around. However, with adverts dominating the page and a slightly cluttered feel to the site, browsing isn’t always quick and easy. Tickets for Music, Sports, Arts, Theatre & Comedy and Family & Attractions available, so there’s something for everyone! 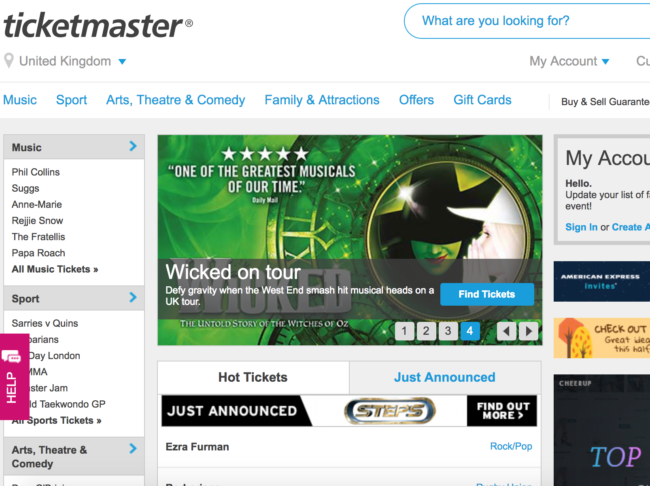 Ticketmaster.co.uk is the perfect place to go to get your tickets on music, sports, theatrical events and more. With a professional website that provides a range of payments options, as well as an app to use when on the go, it’s the ideal market place to find events and gigs near you. Whether you’re looking for tickets for music, sports, theatre or family events, ticketmaster.co.uk has a wide range of events to choose from. Just be patient when browsing, as the large adverts and slow loading times can sometimes mean browsing isn’t as easy as it could be. Go back to our Events & Gigs section for more sites offering tickets on events in the capital.